Superman is sitting in the Fortress of Solitude, listening to a broadcast news account of the destruction in Metropolis. When the report changes to the war torn nation of Bialya, Superman says "No more" and flies off. In Bialya, a boy stubs his toe and falls even as a bomb descends on him from above. We see the explosion but Superman has arrived to save the boy. More shells explode in the sky as the locals surround Superman, expressing their gratitude, and he says he should have been there all along. To make up for it, Superman proceeds to apprehend the Bialyan President, show him the devastation his warmongering has wrought and strip him of both his claim to the presidency and his shirt. At that moment, Wonder Woman arrives and points out that the scene is being caught on camera, with which Superman appears to be pleased. "I have something to say," he says. To the entire world. But first, says Wonder Woman, he needs a shower and a shave. Then they will have a press conference at the United Nations, at which Superman will say what Wonder Woman has been waiting to hear since she first met him. On the front steps of the U.N., Superman apologizes to the assembled crowd, telling the people first that they (the heroes) failed and that in addition to being Superman he's also Clark Kent, former reporter for the Daily Planet. He says as a journalist he spent too much time writing about evil, while as a hero he spent too much time reacting to evil. He says he "doesn't care" about land claims or beliefs, or about the "petty squabbles" of mankind. He will no longer tolerate the taking of innocent lives and calls for a worldwide cease-fire. Or else he will impose one. Story - 3: So, "It's over" are ironically good words to close out this issue, as it's now pretty clear that certain things are indeed at an end. Such as Superman being his original heroic self. I think there's an argument that - despite, yes, a literal act of global dictation - he's not yet an actual practicing dictator, even if it is ultimately a fine distinction, which I'd base on the simple fact that at this point all he's really done is give the world a kind of ultimatum but has not yet had to act on it. Once he does that (because of course someone is going to ensure that he does, probably Batman), then we can start calling him "Hitler" or whatever (even though I'll continue to bristle at it, mostly because of the maniacal racist hate at the core of Hitler's infamy versus Superman being completely misguided and everything but still at his core acting out of a kind of broad beneficence). But anyway I get that the images in the first issue were very Third Reich-ish, so, fine. Superman's account of the tension between his work as a reporter and his work as a superhero - in both instances essentially saying that he has been mostly a passive force for good, rather than an active one - could be an interesting character and story dilemma. It's just too bad his idealized conception of what good is (and thus his entire character) has to change in order for that to change. From a plot perspective and unlike last week, this issue does move us forward, though only in a broad sense. We don't, for instance, learn anything about the "executions" that Green Arrow mentioned last week, specifically whether they are actually happening or what. My sense now (because I don't think we're going to see anything more of the immediate aftermath, though we might get something in later dialogue) is that Superman had killed only the Joker at that time and Arrow was just extrapolating. I mean, execution does pretty much describe Joker's death. Meanwhile, however, I really don't know what to make of Wonder Woman here. On the one hand, she's very fixated on appearances (the cameras, Superman's stubble) while, on the other hand, she evidently has some deep character expectations of Superman, expectations moreover that would seem to align her character with dictatorial sympathies despite no immediate tragedy to push her over the ethical line. Are we outraged at this? Do we think that was maybe not what she thought he was going to say? I'm no Wonder Woman scholar, so I'd love to hear from y'all about this in particular, please. But, so, yeah... an average outing. 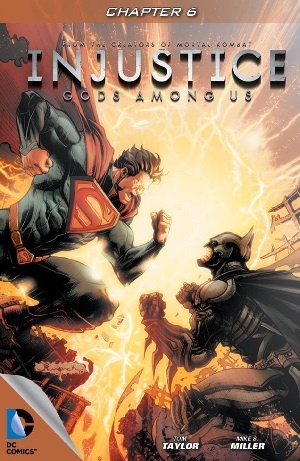 Nothing too crazy (unless you count the secret identity reveal, which I don't, not with Lois dead and Metropolis "lost") or lightning-paced, both of which elements of this I was enjoying, if only because by comparison so much other serialized work is so slowly-paced. And we're also seeing that Superman still has some respect for due process and the law, more evidence that his transformation isn't light switch, which, while important to me, is (I know) a lost cause for some readers. Art - 4: The art is the strongest feature of this book. It's not perfect, and seems to be weakest in panels in this issue showing two or more full-bodied people (i.e., at smaller scales or wider angles). But when the shots are close, they convey powerful feeling (such as when Supes reveals he's also Clark Kent) with subtlety.